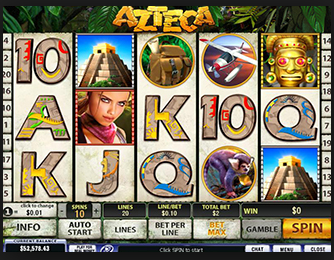 Azteca slot is among the latest additions to the new range of Playtech online slot games. The game is targeted for low-rollers and mid-range wagers since the highest possible bet size is $100, and the lowest bet size is $0.01. Azteca allows players to wager one coin for every pay-line. Since the game is a 20 pay lines games, the maximum coins you can wager are 20 coins. The coin denomination is between $0.01 and $5. Players can opt to play a low rolling game, all pay-line game of $0.2 or a mid-range game of $100 on all pay lines. The fixed jackpot in this game is 10,000 coins. 10, 000 coins on a $5 coin denomination is surely a massive amount. Azteca slot adopts an Aztec theme, with well-illustrated and high-quality symbols. Playtech is known in the world of online casinos to produce High Definition games, and this should not come as a surprise. Azteca slot has some exciting symbols that align to the theme and confirm to Playtech’s quality standards. The most frequents symbols in the game are; the Aztec aeroplane, the Mischievous Monkey, the Aztec tomb and conventional card faces; 10, J, K, Q and A. Most of these symbols will attract payouts when they appear more than three times. The game graphics have been put together and crowned with smooth animation and near-surround sounds. The well-crafted symbols contribute to the general experience of the game while the quality sound is an excellent accessory to bringing the game into life. Azteca will prove to be an incredible online game to play for both newbies and Veteran players alike. Players can play the game in any Playtech powered online casino that supports the new range of Playtech games. Most online casinos will allow players to first play Azteca for free in order to get the hang of Azteca. The pyramid symbol plays wild in Azteca. Since it is a wild symbol in the game, the pyramid symbol can replace all other symbols except the Adventure symbol. Like most Playtech games, the highest payouts come when you land five Pyramid symbols on any active pay line. Players who are playing for any other bet but the maximum bet, get 10,000 coins for a five-of-a-kind wild symbol. However, maximum bets attract 100,000 coins. The scatter symbol in this Playtech slot is the Adventure symbol. The adventure symbol appears anywhere on the reels, and if you land two or more in a single spin, you complete a scatter winning combination. Depending on the Adventure symbols you land, you could get up to 500x multiplier or 10, 000 coins if you had placed a maximum bet. If you happen to fall more than three Adventure Symbols on a single spin, you get an additional 12 free spins. All wins during the free spins get a 3x multiplier. Azteca slot bonus game is triggered when a player lands three or more Mask symbols on any active pay line. The masks must align from left to right in order to activate the second screen bonus. If you land 4-5 mask bonus symbols, you are rewarded with a 5x or 27x multiplier respectively.